INDIANAPOLIS -- A downtown Indianapolis group is concerned about a recent city idea to install a playground near the canal. Indianapolis is working with the Indianapolis Colts to build a children's playground near the USS Indianapolis Memorial this fall. It's part of a 5-year strategic plan for Indianapolis' downtown. But hundreds have signed a petition to try and get the city to rethink the idea. Alisha Roberts is one of those people. "I'm here to be in support of the space -- in support of the green space," Roberts said. "I think having green space is really important for mental health -- for the environment. .. I don't think [the playground] would fit in here. It's beautiful like I said, but I don't think this is the spot it should be placed in." Roberts said it should be on the other end of the canal, where there are already more child-accessible places. The people who signed the petition said they want the city to hear them in a public input session. But the city says it's already done that three years ago. IndyParks said residents first had a chance to give public input in 2013. 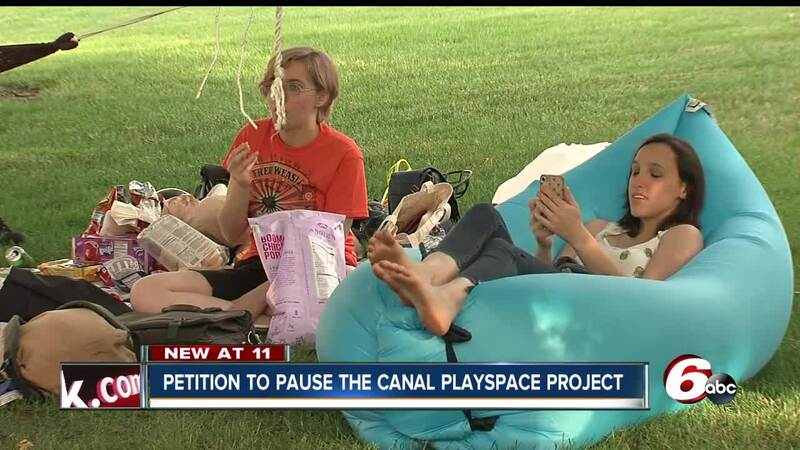 Then in August 2015, the city held another public meeting with the Canal Neighborhood Association to get public input for the design of the playground. But there are hundreds, like Clark Kahlo of the Friends of the Indianapolis Downtown Canal organization, who want their voices heard now. "They should pause this project, in our opinion, and open it up, take public comments and hear the arguments, pro or con, for this land use," Kahlo said.